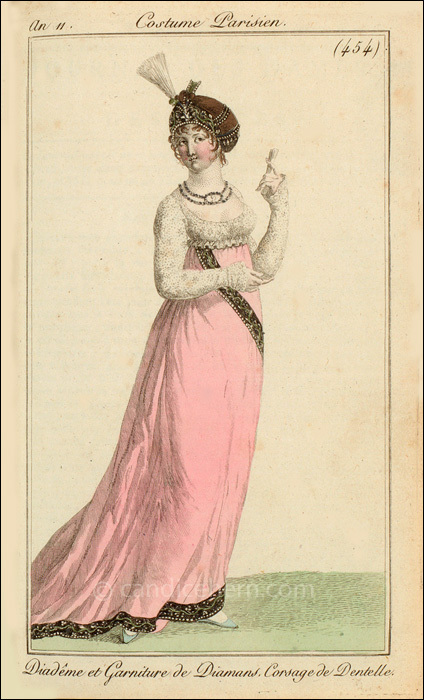 Journal des Dames et des Modes, Paris, March 6, 1803. This is a pretty spectacular ensemble. 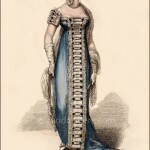 The bodice is made of white lace, with a short ruffle beneath the bosom. 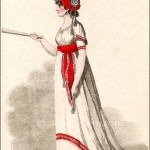 The sleeves are quite long, with loose cuffs hanging low over the hands. The pink skirt is trimmed at the bottom and diagonally across the front with a band that, according to the description, includes diamonds. There appears to be a row of diamonds at the edge of the trim, and there may also be diamonds in the floral pattern. The skirt is made with a substantial train. More matching jewels adorn the neck. The centerpiece of the necklace holds a cameo. 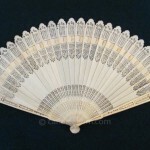 And finally, the woman holds a very small opera fan. This is not a court dress — Napoleon would not declare himself Emperor for another year — but is an opulent enough ensemble to have been seen in one of Napoleon’s lavish entertainments.